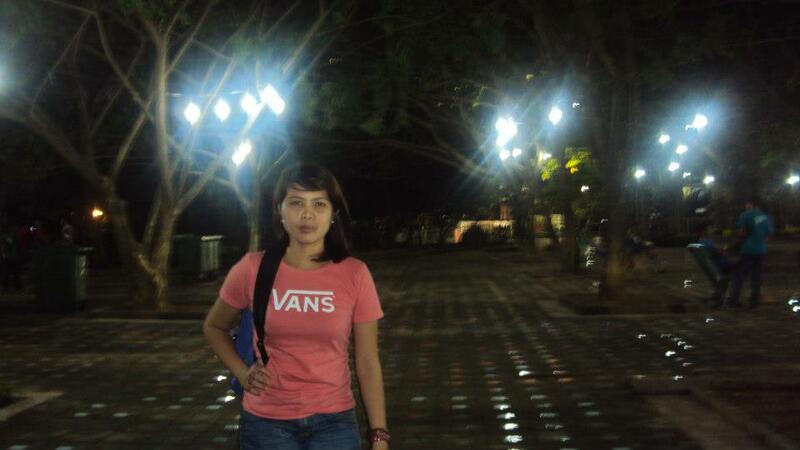 As a jump start to the year 2013, my mom and I decided to visit the vast city of Davao. The initial plan was to book a ticket for Davao, avail one of those city tours and sleep at Pearl Farm- a beach resort in Samal Island widely publicized as a tourist hot spot. Yet, as I began researching and reading blog posts from DIY (do it yourself) travelers, I realize that it would be a hell of an adventure if I plan our trip just like these backpackers did. We rarely rode their taxis and opted for commuting and walking. We didn’t hire a tour guide, instead we bought a map, did vast research and asked the locals for directions. And we never checked- in at Pearl Farm, we were at the Royal House, which on our second day gave us 50% discount on room accommodation. Kudos to my nanay, who was all out with this adventure! We booked the ticket from Cebu Pacific’s piso fare last November 2012. 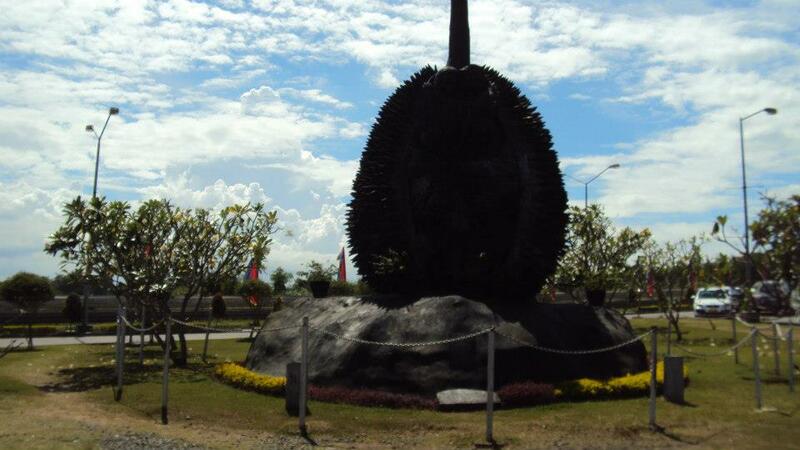 Travel time from Cebu City to Davao is approximately an hour. From the Airport, we took a taxi en route to the Royal House, the place which we shall be staying for two nights. It is located downtown, at C.M. Recto Avenue. Taxi fare is 173.50 php. We took the Standard Double Room for 1000php inclusive of breakfast for 2. After freshening up, we then looked for a place to eat. Based on our map, a Jollibee is nearby so we had our late lunch there. Chowking and Mandarin Tea Garden is also a walking distance from the hotel. We were supposed to visit the Philippine Eagle Center that day but they close at 5 pm so we decided to visit the place the next day. We went to Matina Town Square in Matina to book us tickets for the Quiboloy’s Restored Garden of Eden but as it turned out, their ticketing office is not located there. We took a jeepney with the Matina placard to reach the Town Square, fare is 8 php. 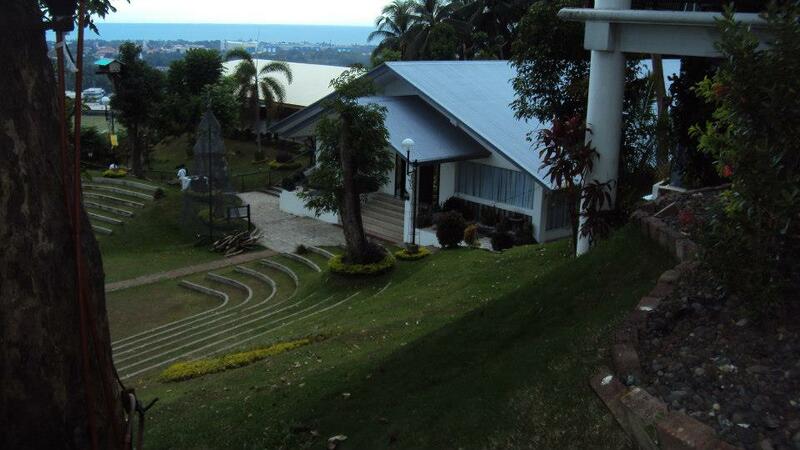 On our way there, we passed by Davao River and Ateneo de Davao High School. 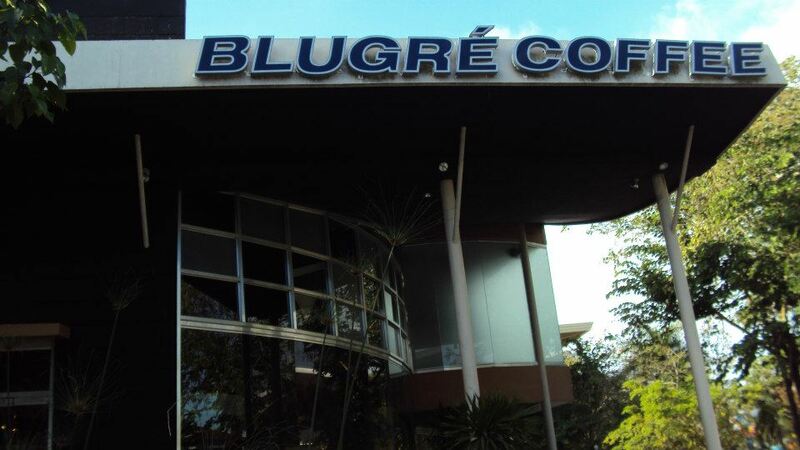 The Blugre Cafe in Matina Town Square. As I’ve read with previous blogs, they have this durian coffee which is to die for but since I’m still too stuffed from our lunch, I decided to make a pass. After that short trip to Matina, we decided to go to Bankerohan Market and ask for some directions to Philippine Eagle Center. It was easy to find since we just have to trace our way back from Matina Town Square. It was quite a long walk though! The market was full of Durian! haha. A kilo would cost only 45 php compared to 100php per kilo here in Cebu. 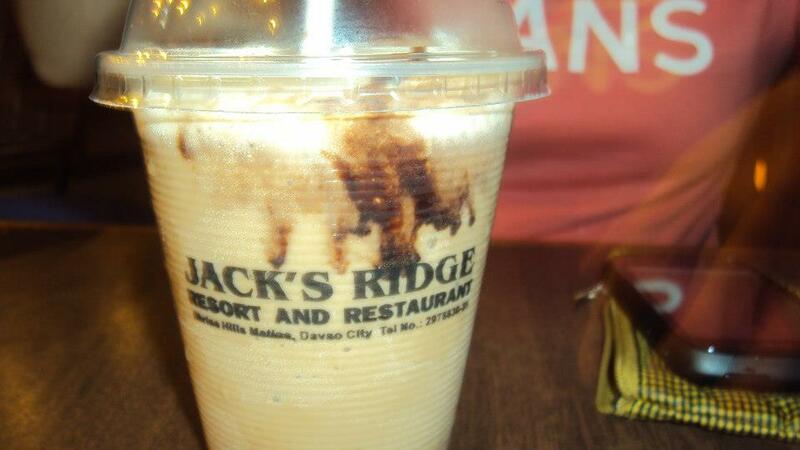 JACK’S RIDGE RESORT AND RESTAURANT. Located at Shrine Hills, Matina, Davao City, Jacks’s Ridge is a favorite place for tourists and locals to hang- out and dine. The place has a restaurant (Taklobo Restaurant), coffee shop( Karlo’s Gourmet and Coffee), pool (Kool Kat’s Pool) and a souvenir shop. It’s great for strolls and hosting of special events such as weddings and birthdays. 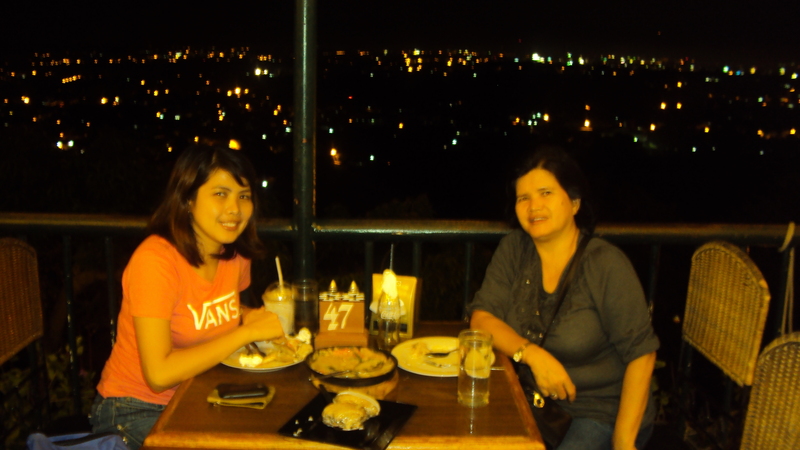 Dinner at Taklobo Restaurant overlooking Davao City. Tip. Try their Durian coffee for 125 php. After our heavy dinner at Jack’s Ridge, we decided to visit People’s Park located at Palma Gil St. We were awed by how the Dabawenyos maintained its cleanliness and safety. It was a gated park with a single entrance and separate exit. Upon entering, you shall be passing a series of inspection such as checking of brought items and frisking. Not far from the entrance is the post for military men. Tell you, the time I was in Davao, I never felt any safer! Military presence is something common there. We roamed around the park and took some pictures. En route to our hotel, we decided to walk using our map as guide. The streets were crowded with vendors and strollers since it was a Saturday night. 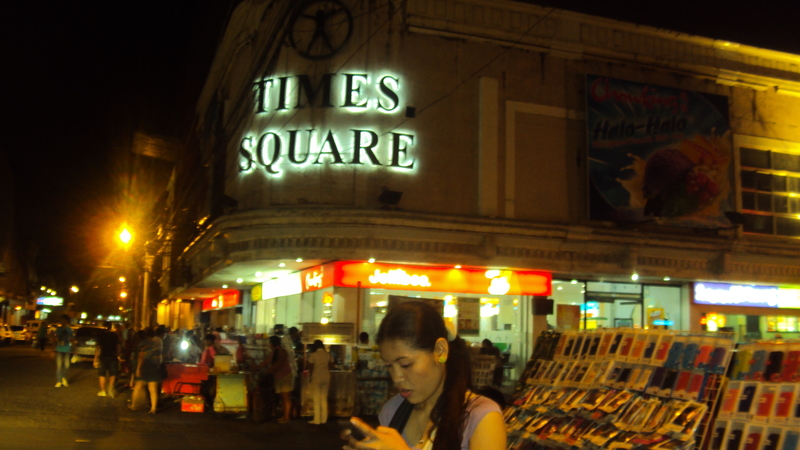 We even went inside Times Square near Gaisano to buy a pair of slippers for nanay. SUNDAY MASS AT SAN PEDRO SHRINE. I didn’t sleep all night, great thanks to the Durian coffee!haha. We know it is going to be a long day so we decided to attend mass as early as 5 AM. The church was just a walking distance from our hotel. We then enjoyed our free breakfast at the hotel. Located at Leon Garcia St , we went there by riding a jeepney from our hotel. We just told the driver to drop us at the Magsaysay Fruit Stand. 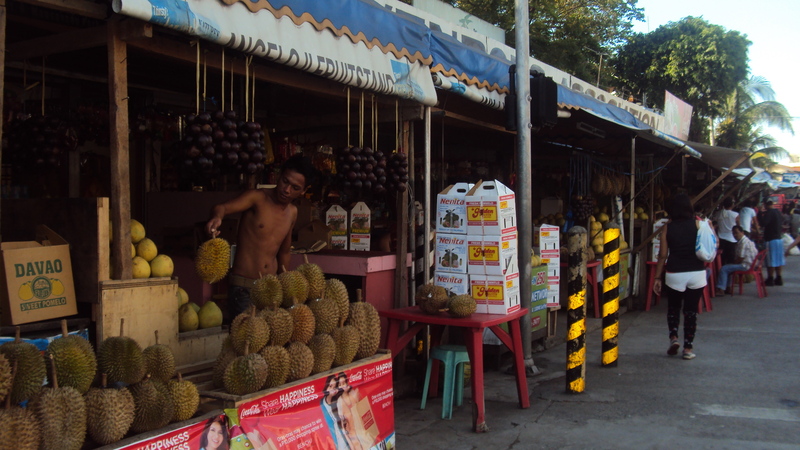 It is a great place to buy pasalubong since you can haggle with the vendors. From there, we went back to the hotel to leave our bought pasalubong. We hailed for a jeepney that would pass C.M. Recto Avenue (where our hotel is located), another option would be a jeep passing San Pedro church and you’ll just walk your way to the hotel. Tip. Buy Lola Abon’s durian yema and candy. From the hotel, we rode a jeepney to Bankerohan Market. From there, we rode the Annil Transport Bus. This will take us to Calinan where the Philippine Eagle Center is located. Fare for the bus is 45 php. It was moving slowly though, so it took us almost an hour to reach Calinan. You just tell the driver or the conductor to drop you to the terminal where habal-habal and tricycles going to PEC are located. Tricycles are rare so we opted to ride the habal-habal, fare is 15 php per person and took us 15 minutes to reach Davao Water District. From the entrance, you will be asked to pay 5 php for the Davao Water District then another 50php once you enter PEC. 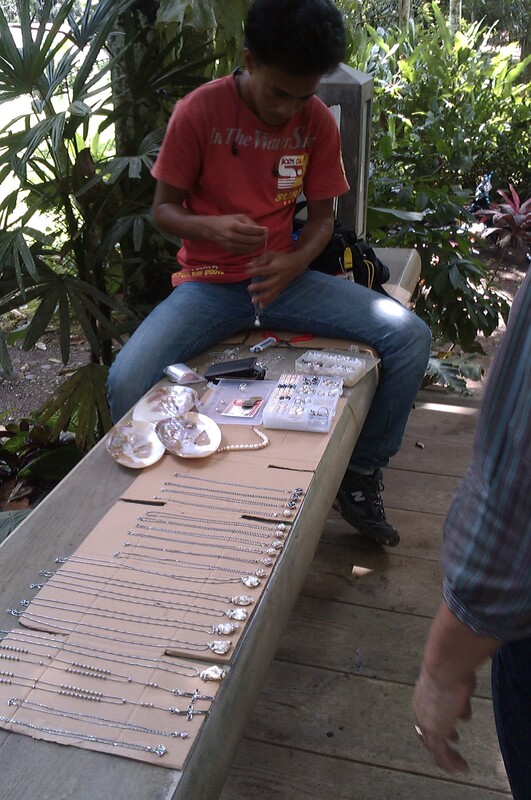 On our way to PEC, we’ve met a local selling Nito bracelets. We bought some for pasalubong since it was very cheap. 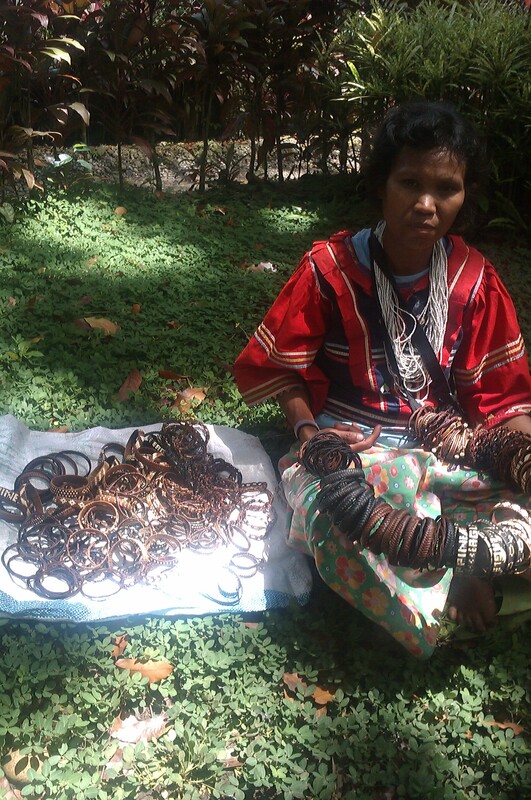 Then we also encountered a local from Zamboanga selling these pearls. He said that he was the one who dove these shells from the bottom of the ocean. 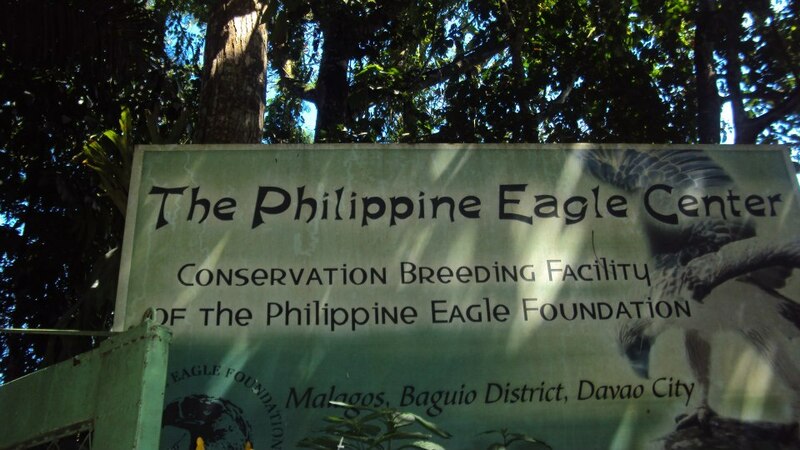 At the Philppine Eagle Center, you can see almost every kind of Eagle there is. It was really a forest only with caged animals. Seeing all these birds caged made my heart ache. Instead of being able to fly to the farthest places of the Earth, they are stuck there being watched by curious tourists like me. There are souvenir shops near the main entrance. We bought some shirts for pasalubong. Tip. You must make arrangements with the habal- habal driver to wait for you at the PEC or pick you up at a designated time. We didn’t ride the Annil bus on our way back since we find it so slow. Instead, we took a jeepney that would take us downtown. Our visit to the Island Garden City of Samal was quite short. Please see separate post for Samal Island. From Samal, we went back to our hotel to take a short nap. We then headed to Merco for a taste of their durian shake. It was heavenly! When you’re in Davao, you will see the name Merco in almost everywhere you go. Hence out of curiosity, we went in and tried their durian shake. Based on my research, Merco has 31 stores all over Davao. Lucky for us, they have a branch just a few steps away from the hotel. 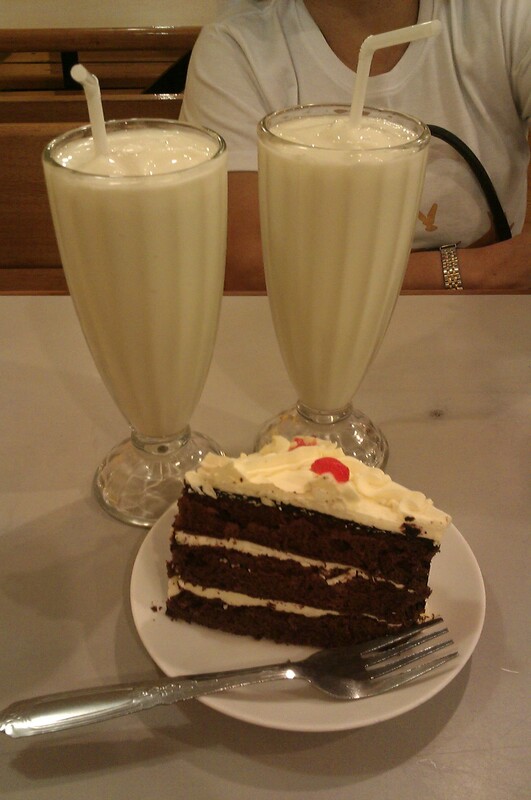 The shake costs only 60php. That was our last stop. The next day, we flew the 8:20 flight to Cebu. Experience Davaos City’s Cultural Heritage by staying in its 2nd oldest hotel – the Apo View. Located at the heart of the City, the Apo View continues to accommodate it’s occupants with the hospitality liken to a really tight family!